Departure of the Col de la Colombiere. Climb to the lake of Peyre and the Pointe de Balafrasse. Climb the Pointe du Midi (2364m). Descent via the Combe Sauvage and the Grotto Montarquis. 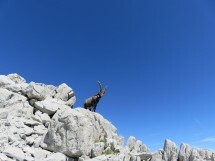 There is often ibex in the sector. A steep descent of Combe Sauvage on scree. The circuit can be changed in case of bad weather. Technique: Be sure footed, and be in difficult passages with ease. Elevation gain 905 m, 8 km distance. Total length without breaks 6 hours.